Along with Entry, Exodus (i.e. leaving Burning Man) is potentially the most painful part of the event if you hate lines. I hate lines. Leaving anytime on the final Sunday after early morning (the day after the Man burns) or the next day - Monday - risks a very long line to get out. This isn't Burning Man's fault, however - it's a function of the fact that the only road is a two-lane road, and it's simply limited in how much traffic it can accommodate. Before we go any further, the single most important thing to remember about Exodus is that you must de-MOOP your camp first. Everything must go with you. Scour the territory that you were responsible for and pick up everything. If it's not playa dust, take it with you. 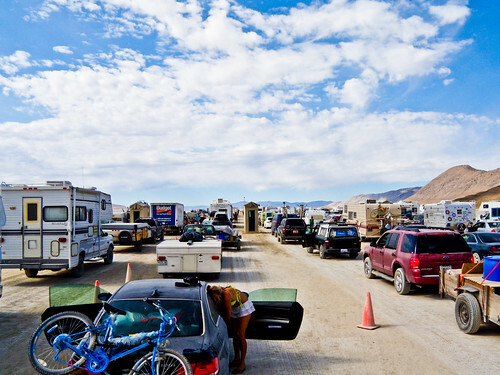 You can dump garbage for about $5/bag in Gerlach soon after leaving the playa. Once you're ready to go, listen to BMIR radio to hear about estimated wait times. If it's terrible, you might want to consider hanging around camp with friends. It's way more pleasant than sitting in a long Exodus line, though some disagree. You can expect Exodus to take anywhere from 45 minutes to 8 hours depending on the time you leave and the year. It's fairly unpredictable, unfortunately. A few years ago, the BMORG started a policy called 'pulsing' that makes Exodus less painful. In this scheme, instead of creeping slowly forward for hours and hours, you stand still and can turn off your vehicle for an hour, and then your lane will be 'pulsed' forward all at once. The upside of this plan is that you end up with temporary 'neighborhoods' during Exodus, and people have been known to break into impromptu dance parties, bbqs, etc. Personally, I hate lines and have real life requiring I'm back on Monday, so I either leave Saturday night right before the Burn or early Sunday morning after. In both cases, any Exodus line is minimal. Protip: If you leave Saturday night and are headed west or south, consider staying the night in Reno. You'll be tired and a mediocre meal has never tasted so good after 7 days of eating on the playa. Plus, a real shower. Heaven. Make sure you book ahead of time though, as that's a holiday weekend so pretty much all hotel rooms in Reno will sell out ahead of time. There's also the option to attend one of the unofficial multi-day afterparties in Reno. For instance, the Grand Sierra resort and hotel typically has some kind of post-Burning Man event going on. In 2014 (when this was written), Thievery Corporation played the after party.